Union President: Subway workers should seize on the tournament and elections later this year to pressure authorities. SAO PAULO: Sao Paulo subway workers defied a court ruling Sunday and extended a strike threatening to cause traffic mayhem at the World Cup's opening game in Brazil's biggest city. The subway staff's union voted to press on with the strike hours after a labor court ruled it was illegal and imposed a $222,000 fine for every day they fail to work. The strike has already caused massive traffic jams in the business hub of 20 million people as the city's new stadium prepares to welcome more than 60,000 fans for Thursday's Brazil-Croatia game. The ruling came as more teams arrived in Brazil, with Germany greeted by several hundred people at its northeastern base and England landing in the picturesque city of Rio de Janeiro. Eighteen of the 32 teams are now on the ground, but the chaos gripping Sao Paulo -- the latest in a wave of strikes and protests ahead of the tournament -- has distracted the usually passionate footballing nation from the World Cup buildup. Union president Altino Melo dos Prazeres told subway workers they should seize on the tournament and elections later this year to pressure authorities. "There's a World Cup, the biggest sporting event in the world. The state government has elections at the end of the year. It has to negotiate," he said before the union voted to maintain the strike, according to the G1 news website. The 9,000-member union said it would hold a protest on Monday morning at a metro station where police used tear gas and truncheons to disperse strikers last Thursday. The demonstration with the Homeless Workers' Movement (MTST) and other groups promises to add more traffic headaches in a mega-city already congested by the subway disruption. The protest over wage demands is the latest social upheaval to hit Brazil, where there have been angry demonstrations against the World Cup's $11 billion bill. The five-line subway system has been partially operating, but trains were not arriving at Corinthians Arena, which will host the opening game. Union workers have reduced an initial demand for a 16.5 percent wage hike to 12.2 percent, but employers are offering only 8.7 percent. 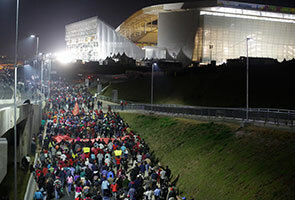 Authorities are hard-pressed to resolve the latest labor dispute to avoid another embarrassing incident in a World Cup hit by delays, cost overruns and protests even before it has started. The 61,600-capacity Corinthians Arena has itself been plagued by delays, and construction workers were racing against the clock over the weekend to finish it before the opening whistle. Workers were wiping seats, checking beams and installing wiring in two temporary stands for 20,000 fans late Saturday. VIP room sofas and fridges for food stands were still wrapped in plastic. Construction workers told AFP they still had much work to do but voiced confidence they would be done before the game. In another dent on the preparations, FIFA announced that US pop star Jennifer Lopez had pulled out of the opening ceremony at the arena due to "production issues." Lopez recorded official World Cup song "We Are One" with rapper Pitbull and Brazilian singer Claudia Leitte. Delays at five of the 12 host stadiums have contributed to the rising bill of hosting the tournament, infuriating many Brazilians who have held protests demanding President Dilma Rousseff spend the money on hospitals and education instead. Rousseff insists the money spent on the tournament will leave a legacy of modernized airports and transport infrastructure that will benefit Brazil for years to come. But much of the promised train and road infrastructure has been shelved. Last year's Confederations Cup, a World Cup dress rehearsal, saw more than a million people take to the streets, but this year's demonstrations have been smaller. Rousseff, who is seeking re-election in October polls, urged her countrymen to show "the example of happiness, strength and civility of Brazil." "I am certain the World Cup will be a celebration," the president said as she inaugurated a public works project in the southeastern state of Minas Gerais. "It is fundamental that people, the majority of whom are Brazilians, also have the right to enjoy this great party."